Hu hu hu. Today, I received a package from Walton of Attitude Bikes, Singapore. I was in desperate need of a new set of v-brake pads for my Monty 221PR. The old pads were worn out and I had some close calls when the pads slipped a tad a couple of times in the past couple of days. In my last post I wrote about the possibility of trying out a riser handlebar to replace the flat handlebar on my Echo Pure, well, I must confess that I could not resist. In my SOS to Walton, I requested for some pricing on the Monty Riser Handlebar, both second-hand or new. 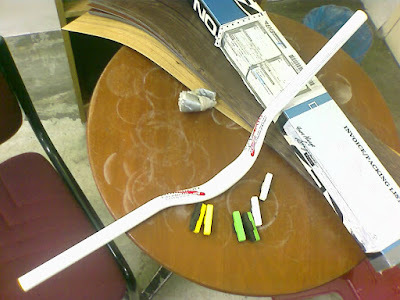 Turned out that there was this Taiwanese manufacturer that made an exact copy of the Monty Riser Handlebar. The brand name was Worldcat. 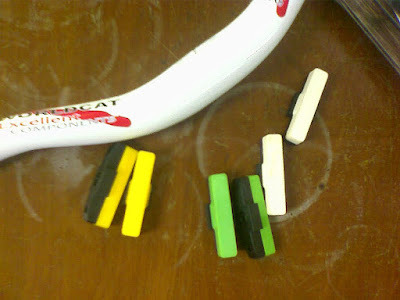 The Worldcat Riser Handlebar. Looked almost exactly like Monty's. The brand new brake pads. I wonder if Sean would be interested in the green ones to match the colour of his Echo Pure rims. And now, I am holding the Worldcat handlebar in my hands.... I can't wait to go back home after work to install and try out the new handlebar! I will post an update here later.